Watch American Morning weekdays starting at 6 a.m. ET. And check back here for frequent updates from Sean about his experiences living on food stamps. CNN's Sean Callebs reports on what it's like to live off food stamps for a month. 3:30 PM ET - Let's see hump day, as I head for completion of the second week on food stamps. A few thoughts after spending part of Monday in CNN's New York building. I saw a lot of friends I hadn't had a chance to speak with in a while. Many wondered if I am really sticking to the diet and the $176. Absolutely. Secondly, a few wanted to know if I had time to grab lunch, or a quick bite before realizing, "oh, yea... that is why you have cheese sandwiches and a salad in that bag." I also talked to some people outside work who live in NY and the same thing, "Can you stay in the city and grab dinner?" It made me think about a couple of things. One, the whole social aspect of not being able to just go out and sit down with people and eat. Granted I could go sit down with them, but I imagine in the back of their mind they would be thinking, "..is he going to say 'are you done with that.'" I am not saying that to be funny, it's just another part of my life that has changed --and a change I didn't anticipate. Secondly, I am only doing this for a month. But, I imagine there is a certain awkwardness, or feeling of being uncomfortable when someone says "let's go eat," and one cannot afford it. Today, I had tea, cereal for breakfast. Cheese omelet and salad and lemonade for lunch. Tonight, black bean, over rice with baked chicken. I really look forward to the emails, so keep sending them. Seems everyone can tear me apart for shopping habits, what I eat, what I don't eat. Tony picked up on that. He said he knows I have "not been perfect" but appreciates the effort and the fact I am learning as I am going. He points out a lot of people who have never had to rely on food stamps, and suddenly have to, are in the same boat. You have a limited amount of money and you tend to stick with trying to buy something you are familiar with and still eat as healthy as possible. JT on the other hand says good luck, but at the end of the month I will probably end up "fat, unhealthy, hungry, and in need of seeing a dentist." JT apparently went down that road. He or she, spelled out a healthy diet for me, encouraged me to look at health food stores. JT's monthly allotment ran out with a little more than three dollars still in the kitty, and asks how much I have left. I have more than $70 dollars, but right now I have a fully stocked arsenal of food to keep me going. Remember, I started this project because federal officials said after holding steady at between 26-and-27 million people, about 31 million are now receiving food stamps today. With the price of food escalating some six-percent this past year it made it that much tougher to put food on the table. 1:07 PM ET - Sorry for the late blog, Monday was a long day. Up at 3:00 a.m. to go to New York to talk with American Morning folks about food stamp stories. Back down to Jersey Shore to spend time with my son. Weighed myself for the second time since starting this project, and at 222 haven't gained or lost anything of significance. Getting a lot of emails and thought I would address a few of those. First a couple of people wrote and are taking issue with the subjects in our first two pieces. Arkesha, who took me shopping. And Dynel, who recently lost her job and is turning to a Nola food bank for assistance. I reached out to Juan LaFonta, a state representative I know in Louisiana when I started this project. He helped me find Arkesha. And, it took a while. When he called me back he said, "Sean, this may be a news flash to you but people on welfare don't like to talk about it." The point is we only wanted to approach people with a camera who felt like telling their story. In the food bank, we asked if we could take pictures of Dynel applying for food stamps, and she said, "After what I have been through taking pictures of me is nothing." Look, hunger and all the ills that come with it is a problem all across the country. We are going to a rural area in a couple of weeks to focus on people in need. About 65-million Americans live in rural areas, and we will be telling their story. Secondly, people point out I should be eating more beans. Red beans, navy beans, brown beans. I have purchased a bunch, I just haven't had time to get to them. Love the recipes that are coming in, especially ones that encourage me to use chicken bones for a broth, toss in veggies and whip a healthy soup. I can tell that is in my future as well. Deborah writes in saying she hasn't lost her job but like everyone is trying to save money. She passes on a couple of websites that provide nutritious, affordable meals. http://www.shareourstrength.org/ and www.pueblo.gsa.gov/cic_text/food/rec-thrifty/recipes.htm Good luck. This one from Kendra, is in part why we began working on these stories. She writes that she was a business executive that graduated with a 3.9 gpa. But once her company went under in this economy she couldn't find work and is now on food stamps. Kendra says food stamps are "more dignifying" than having to go to a food pantry. She says "the latter is incredibly embarrassing and shameful for me." My heart goes out to her. Meanwhile, Jack in Tennessee says he has just given up trying to eat healthy. He gets $139 a month in food stamps, buys 20 frozen food meals for a buck each, then stocks up on canned spaghetti. Jack writes he spends about $100 on soda, candy, popcorn, chips, and cookies. He says, "it burns people up to see me buying this stuff with my card, but I don't care. Eating is the only fun I can afford." 10:00 PM ET - I went back to the grocery store to supplement some of the food I have gone through. The good news is I still have two large chicken breasts and half a pound of very lean ground beef in the freezer. Getting lots of emails. Among my favorite, one writer who told me to cook food then freeze it, so I can have a healthy variety of stuff on hand. Her comment was, "the freezer is your friend." I like that. A couple of things - some took exception to an earlier post when I said one thing I learned is people who have never had to live on food stamps thing $176 is an amazingly small amount, while those on food stamps said it seemed like a lot. Clarification: They meant it was a lot for ONE person to receive, not that it is easy living on that much. Believe me, it isn't easy, although now I realize I could have shopped and saved more money the first time around. Today, a breakfast of oatmeal and tea. Lunch was two delicious grilled cheese sandwiches (truth is I cannot remember the last time I had a grilled cheese sandwich, now I am wondering why) salad and lemonade. I made stir fry chicken over rice, and some peas for dinner. All-in-all I think today's fare was among the healthiest and best tasting I have had. I am getting a lot of emails of people recommending various diets, or various recipes. I will try some of them. Truth is, other than cooking basics like steak, chicken, fish, I am really inexperienced in the kitchen so a lot of these look like good alternatives. Oh, even my mom emailed a recipe. It involved salt pork, to be used to bring flavor to some rice, beans etc. I still can't believe she emailed me. I am pretty sure my mom knows my phone number. Secondly, my daughter Caitlin is a freshman at the College of Charleston she said the blog started a discussion among her friends. She has a few buddies from Louisiana and they were shocked to learn that one in six in that state are using food stamps. A vote on the stimulus bill is coming up, and a lot of people who received government assistance for food should watch closely. The bill calls for increasing the amount of aid they receive by 13-percent. Louisiana for example, pays out about 80-million federal dollars each month for the food stamp program, so you are talking about 10 million dollars more a month just in that one state. Proponents say by beefing up food stamp payouts, farmers and producers will be guaranteed jobs. Wholesalers and grocery store employees will keep their jobs, because more food is being purchased. And, more food means healthier diets. That is significant because that will keep the very young and very old healthier and away from medical visits where they will be saddled with bills they can't afford. 1:42 PM ET - Anyone following this blog knows that part of the President's economic stimulus package calls for increasing the amount of assistance to food stamp recipients by 13 percent. That will translate into billions and billions of dollars. The price of food has shot up by about six-percent over the last year, due in large part to fluctuating energy prices. Even the newly appointed Secretary of Agriculture Tom Vilsack, whose department oversees the food stamp program, understands people might not get the link between food stamps and helping the souring economy. Here's how Vilsack spelled it out. Think about all the people who deal with food everyday, from the farmers and producers, to the wholesalers and the distributers, down to the people who bag our groceries. An infusion of cash will help those people keep their jobs, and hopefully provide work for even more people. Secondly, just a little bit more money each month for people living in poverty will translate into healthier diets. Healthier diets mean people won't get sick as easy, and it keeps them from being saddled with doctor bills they simply couldn't pay. Meanwhile, we are going to be spending more time at food banks. The one a lot of you are writing about is Angel Food Ministries. For 30-dollars they fill a box full of groceries. Enough food to keep a family going for a week. There are several in Louisiana, we are going to be visiting one in a town called Houma. One thing that is clear after diving into this issue, the need for food stamps is not simply an urban issue. 60-million Americans live in rural areas, and they are hurting like everyone else. People have also been pointing out I didn't spend wisely when I bought pre-packaged items. I needed to do that because I often travel for work. And even on the road I am going to continue this program. I can take oatmeal, powdered drink mix, rice, and such with me. And I will. I have a camera and will document how I live on the road. I promise, no free breakfast buffets. No handouts from colleagues and friends. 2:40 PM ET - Very sobering day reading a lot of the e-mails that are now rolling in. There are so many heartbreaking and hard-luck stories, like Cherry in Tupelo, Mississippi. She and her husband lived what she called a very "comfortable" life until the company her husband worked for went under. Now, almost in their 60's she fears it will be tough for either of them to get a good job. Couple that with two bouts of cancer and their savings is exhausted and government benefits could very well be in their immediate future. A lot of folks like Colleen, blistered me for not using coupons and for not going to a mega-store to buy in bulk. We wanted to shoot our story in a large store (you can probably guess which one) but we were denied access. So, we decided to shoot where our subject, Arkesha, shops at other times. I will try to drum up some coupons for my next outing! Someone described as a "frustrated" case specialist who handles food stamp applications also weighed in. Saying, there are some real problems with the food stamp application process. This person says the government uses net income instead of gross, and makes a compelling argument that feds should really take into account how much "real" money people have to work with every day. And, goes on to say it is really the middle class that is struggling right now much more than people realize. Dennis says he's been inspired by our stories and now he is going to try to live on 176 dollars for the month. Good luck, I am curious what you find. A lot of people also say they believe someone can buy enough food with 176 dollars to fill their stomachs, BUT, is it healthy, is it nutritious, is it filling, do you eat the same things over and over? Yes, yes, yes, and so far....yes. I bought a lot of carbs when I went shopping. I am relatively active so that hasn't been a drawback... yet. But some seniors write concerned that their carb heavy diet is packing on unwanted pounds. They argue food stamps just don't provide enough money to buy a healthy well-rounded diet. I had cereal and tea for breakfast. I was rushed this morning, so I slapped together peanut butter sandwiches, a banana, and some left over rice. Luckily, I am busy at work today or the bland food would be getting to me. 11:40 PM ET - We now have an email address up for your responses, criticisms, and questions. One thing really stands out less than a week into this project. People who have never had to worry about where the next meal comes from think 176 dollars a month to live on is going to be a tremendous challenge. Those who have had to turn to the government assistance think it is amazingly high for one person. Ok, I have said it time and again. Food stamps are supposed to be a supplement to a family's income. But, this is where I am going to get all my food from for the month. I am acting as if I don't have an income, and I am not taking offers from friends. Believe me that was tough when photographer Ken Tillis brought in bar-b-qued chicken and sausage whipped up by longtime CNN friend Chef Scotty Craig. I am doing this because there are so many folks out there hurting, and I am trying to see what it's like. I am not the only person surprised by the growing problem of hunger in America. James Carville was in our bureau today for a spot on the Situation Room. This is a man who knows every nook and cranny in Louisiana, and he was surprised to find out that one in six people in this state are using food stamps. Ok, dinner tonight: baked chicken, red potatoes, and green beans. Had a decent 3 1/2 mile run in the night-time cold. I run past Whole Foods, and a host of great little restaurants on Nola's Magazine Street. I have dropped a ton of money in those places over the years. For the first time I am actually thinking that something as simple as a pizza represents the amount of money I now spend on three days worth of food. We are spending some time in food banks this week. They are an important link in helping families keep food on the table. Feeding America provides food for 25-million Americans. They say demand has gone up 30-percent in last several months. A sad indication that the problem will get worse before it gets better. 12:24 PM ET - The responses continue to roll in. I have heard from a host of agencies that act as food banks to supplement people who are on food stamps. Some people have also written to say, buy your bulk items at this store, meats and such at another, and then try to hit a farmer's market for fresh fruits and vegetables. All good, and noble ideas but the problem is that people on food stamps don't have a lot of money and transportation costs money. Moving on, I had two eggs, yogurt, and tea for breakfast. I brought a banana, two tuna fish sandwiches and some left over mac and cheese for lunch. I'm still wrestling with the diet coke withdrawal. I had a headache at the end of work. I don't know if it was the lack of caffeine, or dehydration but after running, I felt fine. We are going to be talking to the Secretary of Agriculture Tom Vilsack. He is new to the job and he comes in with a lot on his plate, not the least of which is working on the proposed economic stimulus package. President Obama's proposal calls for increasing payments to food stamp recipients by 13-percent. The USDA is in charge of the food stamp program. So, stay tuned. We'll hear what our government officials say about the problem of hunger in America. 2:26 PM ET - So far, so good. Three days under my belt, and my food supply is looking healthy --both in supply and nutritional value. Cereal and a banana again for breakfast. Peanut butter sandwich, and lemonade for lunch. I bought a packet of instant oatmeal in case hunger got the better part of me in the afternoon. Pleased to say that I didn't have to dive in. Veggie dinner. I had green beans, rice, and mac and cheese. That is the good news so far. I miss diet coke. This is what someone struggling with withdrawal must go through. I always knew I drank too much diet coke, but wow, it is really hitting home now. I miss being able to snack. You know, if you want something just get it. I have to say my colleagues in this pursuit are not helping so far. Monday, the crew went out and each spent about eight-dollars on these massive breakfast burritos. This, mind you, while I ate my cereal and tea. Producer Mike Phelan ate about half of his, and then left the other half sitting on a plate on the breakfast table. So, two things about that: One I really thought about how much people drop day in and day out eating out. Secondly, part of me on the inside was really disgusted with the amount of food we waste in the U.S. I am going to head out later and buy a large bag of apples. It should cost around two-dollars, but will be well worth it. Running at least three miles tonight. Energy level has been good. Sleeping great (could it have something to do with no more diet coke?) Still getting a lot of emails and calls about programs to help out people in need. To me, that is the most interesting part of this story so far. We are making plans to interview some of these folks. It is amazing how many families are truly in need. Sad commentary on the state of things in the U.S. The USDA, which oversees the food stamp program, called today. A spokeswoman telling me there has been a "sharp" rise in the number of people seeking federal assistance for food stamps. BUT, she is also concerned there are people who dearly need help, but pride won't allow them to apply for food stamps. I will have much more on that in the days to come. 10:40 PM ET - I thought the story about living on food stamps would generate a healthy amount of interest, but I was surprised by number of e-mails and calls I received . First things first. For breakfast I had a bowl of cereal, a banana, and tea. An hour later I was starving. I wondered if this was what the future held. Lunch, and a peanut butter sandwich, and iced tea did the trick, hunger pangs gone. Dinner was spaghetti and meat sauce made from lean ground beef. So far, so good. A lot of the folks who contacted me thought it was going to be hard to make it 28 days on food stamps. Others questioned my shopping habits. One person wrote that I was "whining" about not buying enough fruits and vegetables and basically blistered me for not doing a better job. Come on, I am trying! Rutgers University called about a program they have to fight hunger in America. The USDA, which oversees the food stamp program, also contacted me. They commended CNN for focusing on the problem of hunger in America. USDA officials say I am exactly right in saying the sour economy has pushed some people who never thought they would need government assistance into welfare lines. I will definitely talk more with them over the next four weeks. No running on Monday. We did reports from 6am, through 8pm. I will shoot for a long run on Tuesday. On a lighter note, anyone who watched the live shots Monday on American Morning may have noticed the Elvis magnets on the fridge. One of the PR Directors from Elvis Presley Enterprises sent me a message on Facebook. He got a kick out of the magnets, but also said the story was a reality check. 8:59 AM ET - Day two on trying to live on food stamps, and I discovered the first chink in my armor. I am really worried I didnt buy enough fruits and vegetables. I really would love a pear, orange, some apples --but right now it's not in the cards. I have 176-dollars to live on for the entire month. When you break that down it comes out to about $6.28 a day. I loaded up on carbs at the grocery store. The dietician I spoke with before starting this project told me to eat carbs at every meal, saying it will give me energy. I had a healthy portion of spaghetti with meat sauce on Sunday night while watching the Superbowl. I ran three miles Sunday, no fatigue, but it was just the first day. I will say I woke up ravenous Monday morning. During the first few hours while I did live reports with Kiran and John my stomach was growling. But, I held off eating as long as I could. A bowl of cereal, a banana, and a cup of tea. Lunch is a long four hours away. I have had a lot of response from people about this story. Many tell me, "I could do it.. I could live on $6.28 a day." I am sure they could, but remember they dont HAVE to. 31-million Americans do. 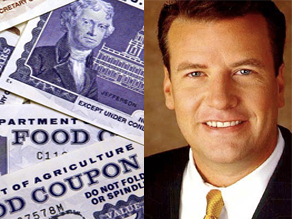 6:24 PM ET - Part of the economic stimulus bill calls for raising payments to food stamp recipients by 13 percent. That's a clear signal there are a ton of people hurting out there. According to the USDA, there are 31 million people in the U.S. that need food stamps every month just to put food on the table. In Louisiana, where I work and live, one out of every six people is on food stamps. Think about it, you fill the Superdome -and ten-thousand people there are going to be getting government aid. To find out what it's like, I approached the state about living on food stamps for a month. So, Sammy Guillory, basically the head of family support for the state, told me the most a single person can qualify for each month, is $176. He couldn't give me the food stamp funds, that would be fraud, even though I offered to reimburse the government. So, I invested $176 in a debit card. First thing, food stamp is a misnomer. It is actually a credit card. And, no one says food stamps anymore it is called the SNAP program. Supplemental Nutrition Assistance Program. Guillory tells me he doesn't think there is a stigma with the program, and the funds are supposed to be a supplement for the money one spends on food each month -it isn't intended to be the sole source of funding. To help me learn the ropes of the program, I met Arkesha Darensbourg, who has been on and off food stamps over the past few years. She has three small children and says the assistance really helped. We walked up and the down the aisle at Rouse's grocery store near my house. "Don't buy name brands," Arkesha constantly reminded me. Oatmeal, mac and cheese, rice, pasta, the cart began to get full all the time I was worried about my budget. There isn't a lot of money for meat, fish, fresh fruits and vegetables. I bought some milk, juice, but state officials urged me to give up bottled water for good ol' tap water. That, made Arkesha laugh. I met with a doctor, --my weight is 220, and I am 6'3". Blood pressure is 128 over 82. I am curious if that will change in just a month. And, I talked with a dietician at Ochsner Hospital here in New Orleans. Eve Dansereau Harmeyer is convinced I can make it through the month on $176. She says I am lucky, I had a chance to educate myself on what to buy. She says a lot of folks on the lower end of the socio-economic status don't, therefore, their diets suffer. Harmeyer told me one person asked her if potato chips are a vegetable. I have been running a decent amount, 20 or so miles a week. Harmeyer doesn't think I will lose any energy as long as I eat carbohydrates. We'll see. I am going to be militant about sticking to the plan. Kind of good I picked the month with the fewest days, but stinks that I start on Superbowl Sunday. While everyone else is wolfing down chips and beverages, I had a salad and some generic brand lemonade.